FEATURE — The Kentucky Lucky Chicken Trail is almost finished. But before we get into that, let’s get to the question that everyone is dying to ask. How did this trail get its name? Well, truth be told when you are out traipsing through the desert either looking for a route to put a trail or actually digging the trail, you find random stuff. I found an old KFC bucket. I am a vegetarian and my find somehow turned into the chicken being lucky – even though it wasn’t so lucky because it had already been killed and eaten. Nonetheless, it stuck and now we have a trail called Kentucky Lucky Chicken or KLC for short. The Dixie Mountain Bike Trails Association began working on the concept for the KLC Trail about 3-4 years ago. The idea was that there was this hill in the middle of town that could be a good fit for a short mountain bike loop. After a couple of years of the association bringing it up and hinting at the possibility, Marc Mortenson, assistant to the city manager of St. George and its support services director, took up the cause with the city. We took the concept, created a rough design and submitted it. Once the city said go, we had shovels in the ground the same week. Actual construction on the trail started late August 2015. Unlike most trails in Washington County, the KLC was built entirely by volunteers. Most of the trail was built by a small group of passionate volunteers that chose to use their spare time to do the back-breaking work of digging single track. A handful of people consistently showed up to build even when the only time we could work was 7-10 a.m. in January. Without these volunteers, the Kentucky Lucky Chicken Trail would not exist. The KLC is located on Webb Hill. Which hill is Webb Hill? It’s the one with the radio towers on it and is surrounded by the Bloomington Hills neighborhood of St. George. The trail is relatively short at 3.8 miles, but what it lacks in distance it makes up for in difficulty. We’re rating this one as a single black diamond, kind of an intermediate-plus. There are plenty of obstacles to keep you on your toes, but at the same time, all those rocks and bushes are relatively small. It starts about a ¼ mile past the end of the pavement on Hillrise Avenue. If you plan to drive to the trailhead, you will want a high-clearance vehicle. The first 100 feet of the road is rough and super rocky. Follow the dirt road up and park where the rocks are lined up to create a parking area. You will also see signs for the KLC marking the start of the trail. If you don’t have a high-clearance vehicle, you can park on the pavement and pedal your way up. As mentioned, the KLC is almost finished. The trail still has a few spots that can use some polish and there are a few more signs that will be installed in the next couple of weeks. With that said, feel free to ride or hike the trail. We recommend riding the trail clockwise. This will give you a more mellow climb to the top and allow for some speedy descending on the backside. This direction is the easier way. If you flip it, there are some stiff climbs and the trail feels more technical. There is not a designated direction, so riders can choose to pedal it either way. As you ride the Kentucky Lucky Chicken Trail, notice the sticker at the top of the signs. It is the new logo for the City of St. George. This trail is the first purpose-built mountain bike trail constructed in cooperation with the city and on city property. The Dixie Mountain Bike Trails Association is proud to have been part of the concept and construction of the KLC. It is exciting to watch the sport of mountain biking grow and to witness local municipalities identify it as an economic driver creating partnerships that mean more trails for the community. About the St. George News “Road Respect” series. 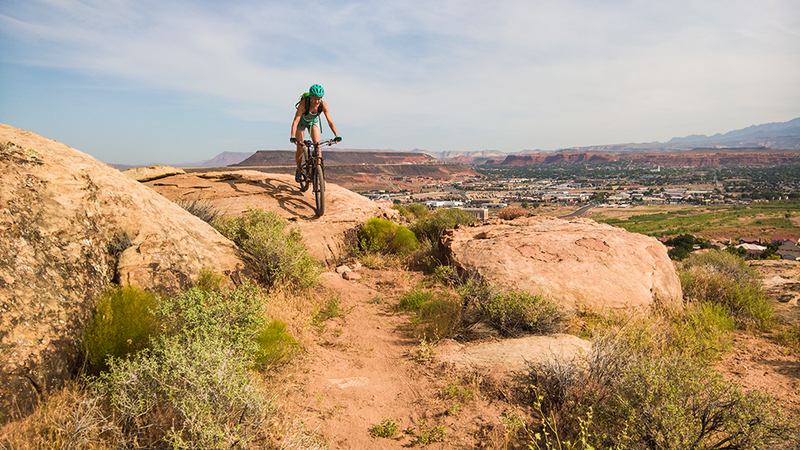 The St. George News Road Respect series of articles is developed in partnership with the Southern Utah Bicycle Alliance, a nonprofit advocacy organization devoted to making cycling safe and convenient for everyone who rides a bike. The series includes news developments, features and sometimes opinion, all related to cycling in Southern Utah. Opinions stated are those of the contributor and may not be representative of St. George News. 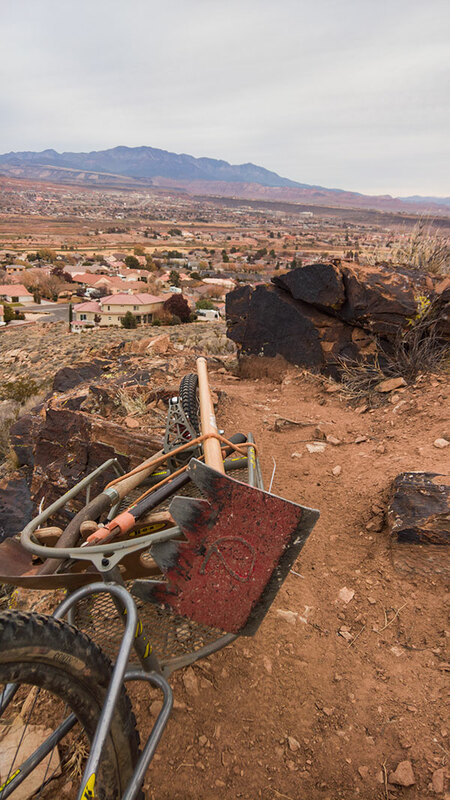 The author of this article, Lukas Brinkerhoff, is currently servicing as president of the Dixie Mountain Bike Trails Association. Read more: All articles in the Road Respect series. After graduating in 2009 with a Bachelor of Art in journalism, Lukas Brinkerhoff chose a more lucrative career and continued to slave away as a bicycle mechanic where he still does the 9-5. Besides contributing to the St. George News "Road Respect" series, Lukas is a monthly contributor to "Cycling Utah" and maintains a personal blog, www.mooseknuckleralliance.org. Lukas is an avid cyclist and advocate; he is president of the Dixie Mountain Bike Trails Association, working closely with the Bureau of Land Management and other agencies to construct and improve local mountain biking trails. In the precious little spare time he has, you can find Lukas Brinkerhoff lost in the desert enjoying the local trails.